Home / Uncategorized / And we are Regional Runner-Up! And we are Regional Runner-Up! 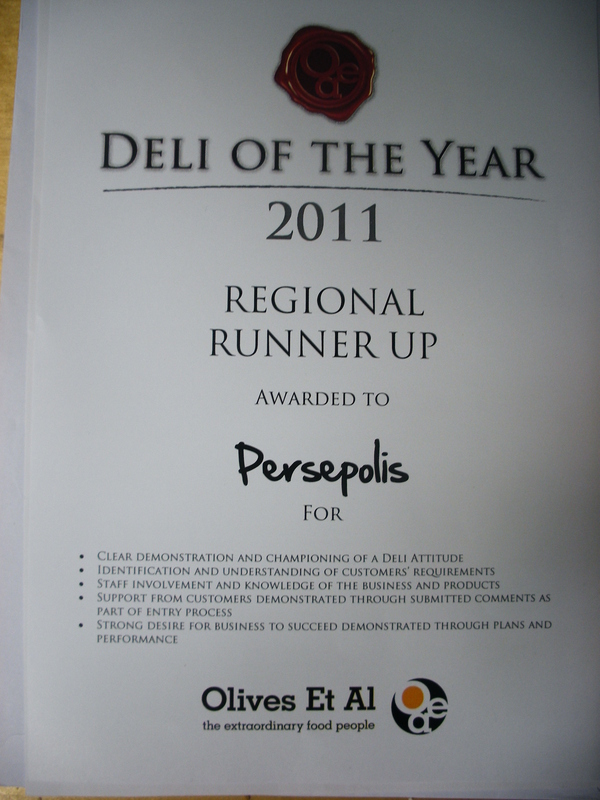 We got into the last 20 or so delis, out of over 400 that entered the competition, and came third in the London region. Which we reckon is something to shout about. Woop woop! Persepolis shoule be Deli of the Year because corner shops are few and far between. Personal service is being lost within supermarkets and Persepolis gives this every day as well as being able to provide excellent food items. Information about the foods being sold is provided with great knowledge and also a smile! Staff in this shop have the best ‘deli attitude’. Awww! *blushes* Anyway – it has had the desired effect and Mr. Shopkeeper is building Mrs. Shopekeeper a food preparation area so we can, well, do more of the same. Only better. Onwards and upwards!